On August 22 and 23, over 220 academics, researchers, and industry and government figures convened at Surabaya’s Universitas Airlangga for the 3rd Indonesia-Australia Research Summit. Presented by the Australia-Indonesia Centre and the Ministry of Research, Technology and Higher Education of Indonesia (RISTEK-DIKTI), the theme of the summit was ‘Innovating Together: Starting local, reaching global’. The summit featured keynote addresses from prominent identities, including Surabaya’s pioneering mayor Ibu Tri Rismaharini; RISTEK-DKTI Secretary General Ainun Na’im; Australia’s Ambassador to Indonesia, His Excellency Paul Grigson; EY Sweeney CEO Marc L’Huillier, University of Zurich Future Cities Laboratory Programme Director Professor Stephen Cairns; and Australian Academy of Sciences Fellow Dr John O’Sullivan. Concurrent research stream sessions also featured. Delegates shared insights across the areas of health, energy, infrastructure and urban water research. Discussions were held on joint competitive advantage in international trade. Innovation strategies between government, industry and academia were explored. And higher degree research students and academics workshopped capacity building strategies. The aim of the summit was to showcase and strengthen collaboration between Australia and Indonesia, and to share these innovations with the world. “If we look at Indonesia and Australia, we see huge potential to develop,” Ainun Na’im said during his welcoming address. Through a translator, Ibu Tri Rismaharini, revealed the innovative strategies – including e-health, environmental management and educational support – that have helped save taxpayer money and improve the standard of living for the citizens of the City of Surabaya. Ambassador Grigson urged both nations to take advantage of the benefits of educational exchange. Marc L’Huillier explored the results of the recently-released Australia Indonesia Perceptions Report. And Professor Stephen Cairns spoke of the cities of the future, which will likely develop in Asia and Africa. 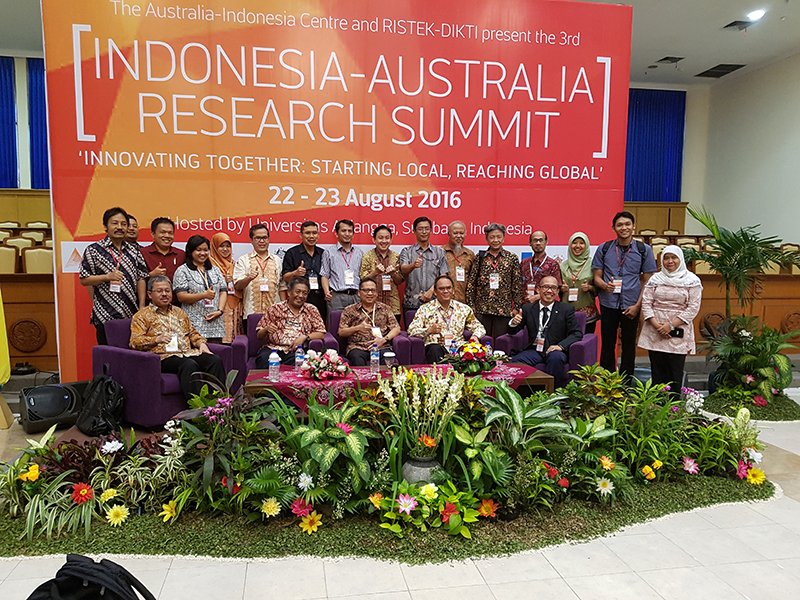 At the conclusion of the summit, Dr John O’Sullivan summarised the learnings before inviting delegates to participate in the Australia Indonesia Science Symposium taking place in Canberra from November 28 to December 1, 2016.